Joel Gutman & Co., Baltimore, MD. Annual Catalogue of Joel Gutman & Co., Fall and Winter 1899-1900, front cover. What patterns of dinnerware would you have chosen for your table? Gutman & Co. sold fifty different patterns, all of which were open stock. Customers were encouraged to choose what was needed from the open stock patterns and then add to the set as time went on or if a piece broke. Unfortunately, this catalog does not include images of all fifty patterns, but it does show one of the patterns, illustrated below. Joel Gutman & Co., Baltimore, MD. 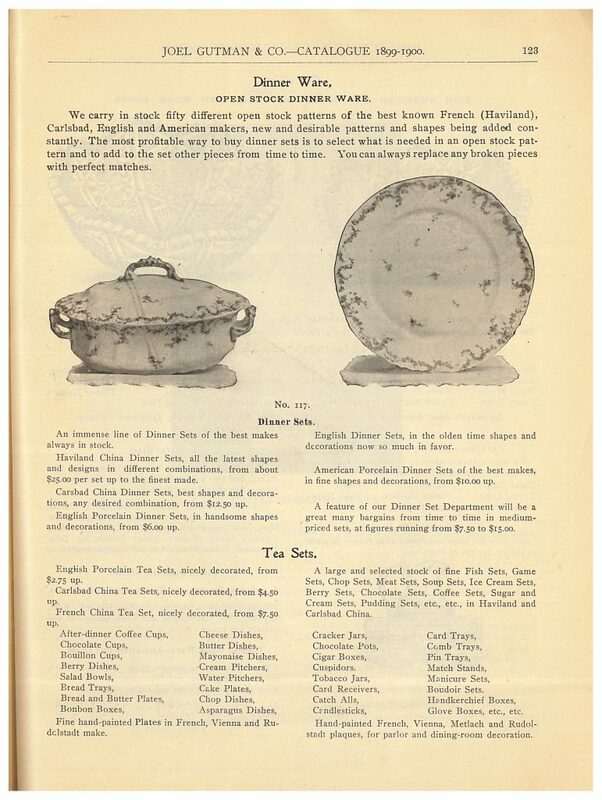 Annual Catalogue of Joel Gutman & Co., Fall and Winter 1899-1900, page 123, dinnerware. The company also offered a line of cut glass, including punch bowls, berry bowls, salad bowls, cream pitchers, cheese dishes, water pitchers, and much more. A list of all the items is included on the page below. Joel Gutman & Co., Baltimore, MD. 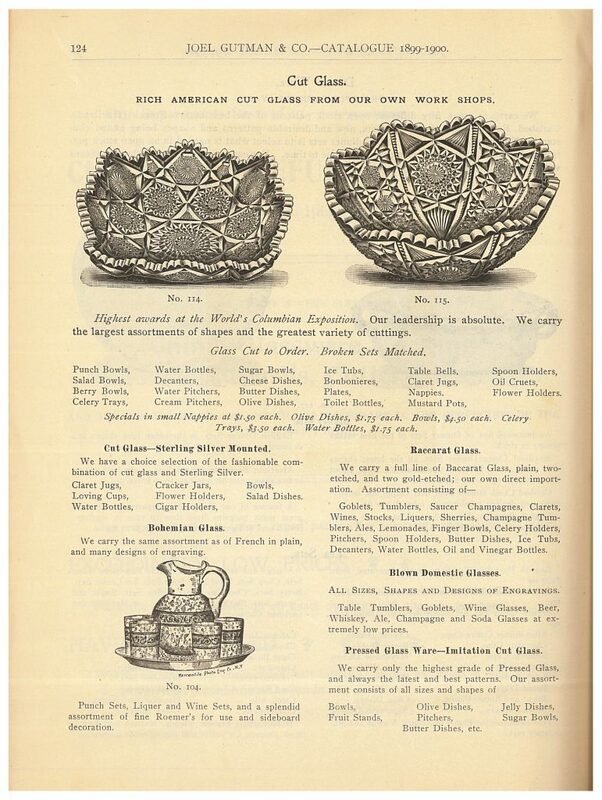 Annual Catalogue of Joel Gutman & Co., Fall and Winter 1899-1900, page 124, cut glass bowls and dishes. If the hostess was preparing for a tea, she could find all the essential items in this catalog. These items included teapots, like the one illustrated below, sugar bowls, cream pitchers, cake stands, cups, saucers, and tea spoons. Joel Gutman & Co., Baltimore, MD. 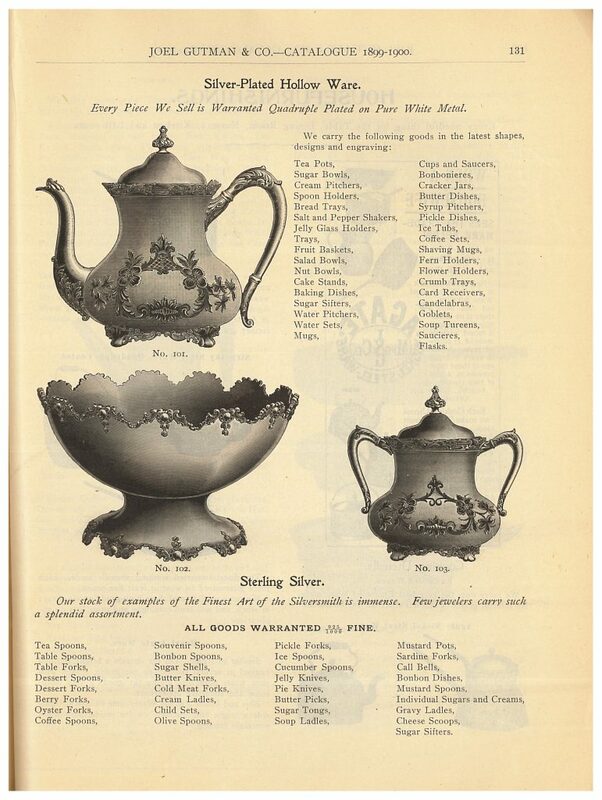 Annual Catalogue of Joel Gutman & Co., Fall and Winter 1899-1900, page 131, silver-plated hollow ware. And finally, how would the dining room or parlor be decorated? Perhaps, one of the decorative lamps shown below might have lit the room while family and friends enjoyed tea or chatted over dinner. Joel Gutman & Co., Baltimore, MD. 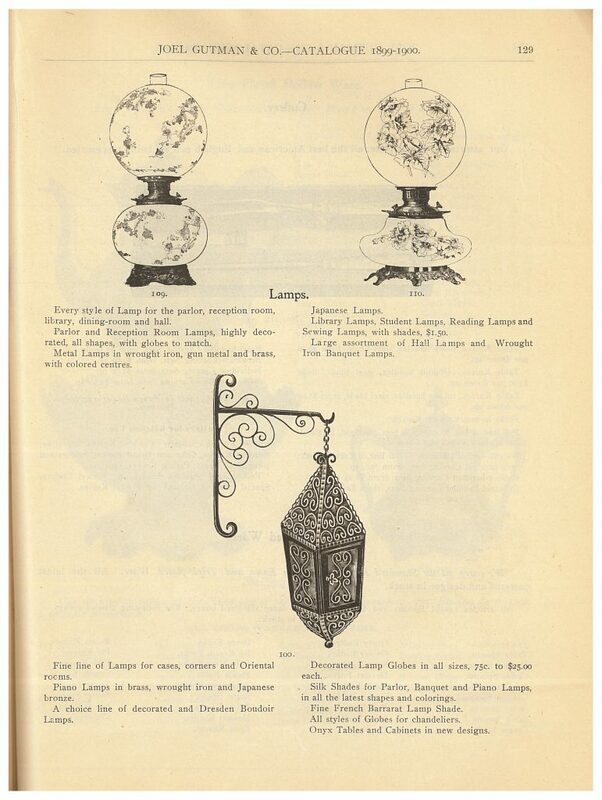 Annual Catalogue of Joel Gutman & Co., Fall and Winter 1899-1900, page 129, lamps. 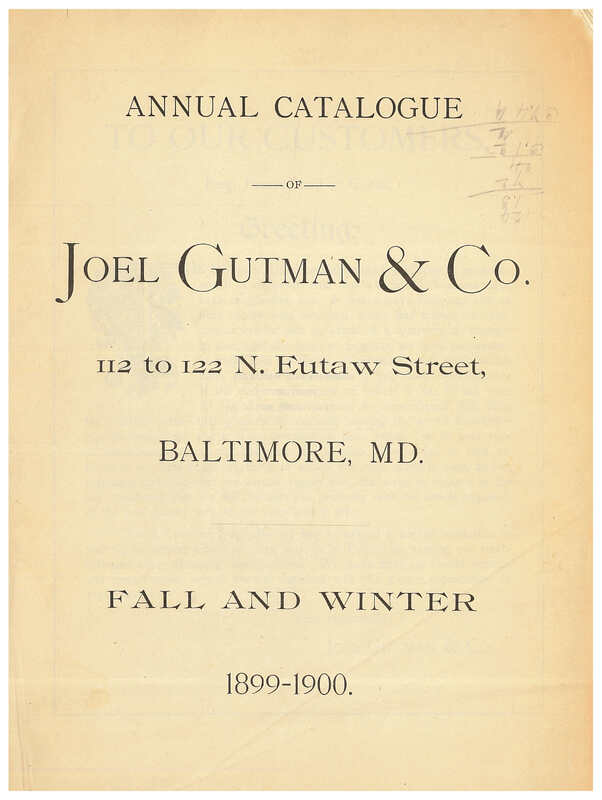 Annual Catalogue of Joel Gutman & Co. from the Fall and Winter of 1899-1900 is located in the Trade Literature Collection at the National Museum of American History Library.